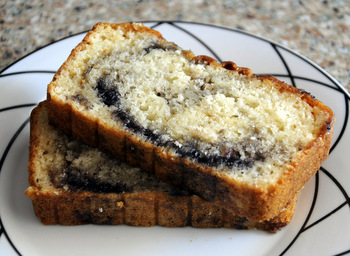 A lot of people don’t like to roll out dough, whether they’re making a yeast dough for bread, a pastry dough for pie or a cookie dough for cookies. Rolling out dough usually means that you need to get your countertop a little dirty (which isn’t fun if your counter isn’t a smooth-surface) and that you are going to need to do some guesswork do estimate how big and how thin your dough is getting while you work with it. Trying to get your dough into a large circle is just one more obstacle. 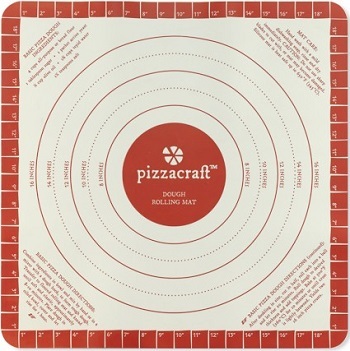 This nifty Pizzacraft Dough Rolling Mat should make things a lot easier, whether you’re a dough-rolling novice or are already an expert. The large mat is measures 20×20-inches square, giving you plenty of room to roll out everything from pizza dough to cookie dough. 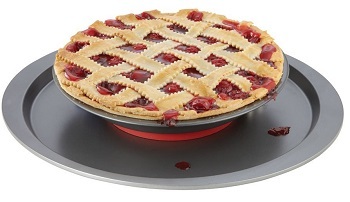 It has circles on the surface that range from 6-inches to 16-inches (and you can go up to 18 if you use the square around the premeasured circles) that allow you to easily identify how big your piece of pastry is getting as you work. Keeping with the pizza theme, there is a recipe for basic pizza dough and directions that tell you how to bake it written right on the mat. This makes the mat a handy reference, as well as a good work surface. The mat is made of nonstick silicone that is easy to work on and just sticky enough that it won’t move around the counter as you work on it. It is easy to clean and rolls up for easy storage, so you can fit it just about anywhere. If you haven’t used silicone mats before, you will still need to give them a dusting of flour, but you will need much less flour than you would if you were working on a regular countertop.